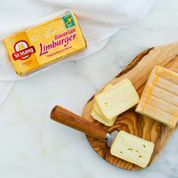 Limburger - Zuercher & Co. This naturally washed rind specialty cheese is made using a traditional monastic recipe. It has a distinctively savory, appealing flavor and soft texture. It is washed with specific cultures that give it an orange-colored rind that may be tinged with scarlet.